The Addis Ababa city government in Ethiopia is Poisoning Stray Dogs by the Thousands... and bragging about it on Facebook. We are begging our friends from across the globe, please help with spreading this story and signing this petition. We need to gather everyone to condemn this cruel practice so we can let the government know it is not right, so they will stop. They care about their image that the new government is trying to build so they can portray themselves as a peaceful loving administration. Our support will let them know that this is a barbaric and unacceptable practice in a peaceful society, so they must find better alternatives. The government in Addis Ababa, the capital of Ethiopia, is back on to its evil street dog poisoning work and bragging about it on the national broadcaster's Facebook page. So far, they are saying they have poisoned 7,800 and are promising to continue doing so in a much larger scale. The act is often carried out in unimaginably cruel ways where government workers throw poison-smeared meat from trucks for the dogs and any animal around to feed on. After eating the infected meat, the animals languish in agony, dying a slow and painful death. Then, once they die, their bodies lay around dead for a long timem causing even further damage to scavenging animals, wildlife and birds as the poison continues to spread throughout the ecosystem. And it's not just stray dogs that are poisoned in this way. Many dogs with loving homes are also caught in this evil. This is not an uncommon practice in the capital Addis Ababa. The government had seen some backlash once or twice before, but definitely not enough to make them find alternative solutions to the problem of there being stray dogs in the streets of Addis Ababa and across the country. To my understanding, the government has done little to nothing to find permanent and humane ways of dealing with the problem. There has been none or little government sanctioned spay/neutering programs, and no shelters built to my knowledge. Just dogs poisoned and left to suffer in agony regularly. This must stop! PLEASE SHARE THIS PETITION AND TAG ANYONE TO HELP GET THIS STORY OUT THERE SO THEY CAN STOP AND FIND A BETTER ALTERNATIVE. MOST PEOPLE IN ETHIOPIA DON'T AGREE WITH THIS PRACTICE AS SEEN IN THE COMMENTS SECTION OF THE POST BELOW. Also reported by the Facebook page Vegan Ethiopia. *below is my translated version (Amharic to English) of the content in the above Facebook post announced by the national broadcaster Ethiopian Broadcasting Corporation. The city administration of Addis Ababa [capital of Ethiopia] has announced it exterminated 7,800 stray dogs within the past 6 months. 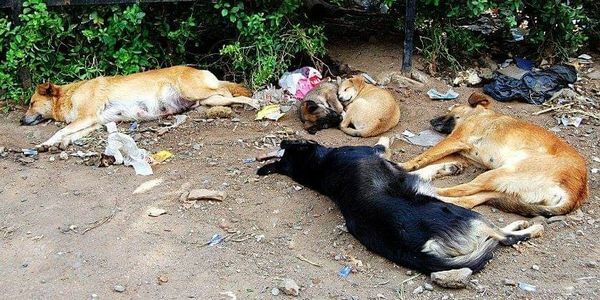 Trade and Industry Bureau of the city council's urban agriculture sector, director Mr. Asegid Hailegirorgis has told Ethiopian broadcasting corporation (EBC) that together with the "community" they are conducting extensive extermination [dog] operation. The director also stated that he is working hard to alleviate health concerns raised within the community from homeless dogs. It is also observed that within only the past six months of the budgetary calendar year *Ethiopia follows different budgetary calendar* 7,800 dogs have been exterminated with the cooperative action of different administrative sectors of the city including beautification, sanitation, health, and all affiliated sectors. The work of exterminating scattered homeless dogs in the city is going with increased scale and speed. Additionally, the administration said that they are working on door to door registration and ownership recognition of dogs in the city. However, the ongoing work of exterminating stray dogs was impeded for the past month due to shortage of drug *poison*. As a result, as soon as the federally appointed drug supply fund resupplies the drugs *poison* the extermination process will proceed with greater scale and capacity. If you read the comments section in the original article and if you've lived in Addis, you'd know most people don't agree with this practice. It always creates terror within communities, as to wondering if their dog is going to be next if she/he manages to get loose. Thank you and please share. We know they respond to international condemnation as they have done so before. So this could be life-saving. Addis is a big diplomatic city they don't want to be seen as primitive and cruel. This practice is a remnant of the old barbaric government that does everything it wants without any concern to public opinion. We need to let them know that this can't go by unchecked.